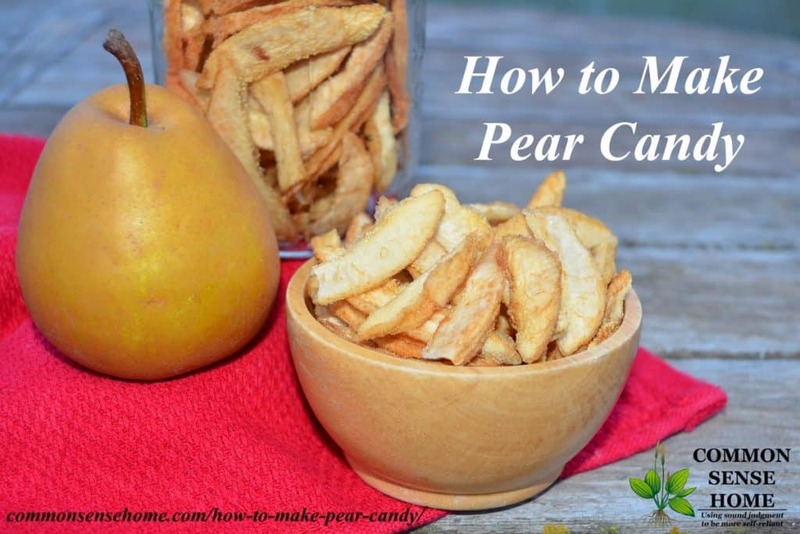 This post was inspired by my friend, Julie, who commented as we were sampling the pears from the dehydrator, “These taste like candy!” Because of their natural sweetness, dehydrated pears make an easy sweet treat. Sulphites destroy thiamine (Vitamin B1) so some experts recommend that foods which are a significant source of thiamine, such as meats, dairy foods and cereals should not be sulphited. In Australia, a number of pet cats and dogs have died from thiamine deficiency due to a steady diet of pet meat containing unlisted sulphites. Since sulphites cleave the thiamine molecule, thiamine in vitamin supplements can also be destroyed by sulphites. For this reason, in the USA there has been a total prohibition on the use of sulphites in meats since 1959, although sulphited meats such as sausages are still widely eaten in other English and Spanish speaking countries. Sulphites are also thought to destroy folic acid. Sulphites have been associated with the full range of food intolerance symptoms including headaches, irritable bowel symptoms, behavior disturbance and skin rashes but are best known for their effects on asthmatics since the well publicized ‘salad bar' deaths of the 1970s and 80s when there were hundreds of reports of severe reactions and at least 12 asthmatics died from eating salads that had been sprayed with sulphites in restaurants. This use was banned in the USA in 1986, but a move by the US Food and Drug Administration in 1990 to prohibit the use of sulphites on frozen french fries was defeated on procedural grounds in a court battle with the potato industry. At first sulphites were thought to affect only a small percentage of the population but in 1984, Australian researchers found that more than 65% of asthmatic children were sensitive to sulphites, and in 1999 the conservative World Health Organization (WHO) revised upward their estimate of the number of sulphite-sensitive asthmatic children, from 4% to 20-30%. With a little prep before drying, you too can keep the fruit light colored and yummy looking – without sulfites. Select pears that fully ripe, at their peak of sweetness. Cut out any damaged sections. For the quickest, most even drying, core and peel the pears and slice into section of equal thickness. You can leave the peels on, if desired, but this will slow down the drying process. It is important that you avoid pieces that are too thick, as these will retain moisture inside that could lead to spoilage in storage. 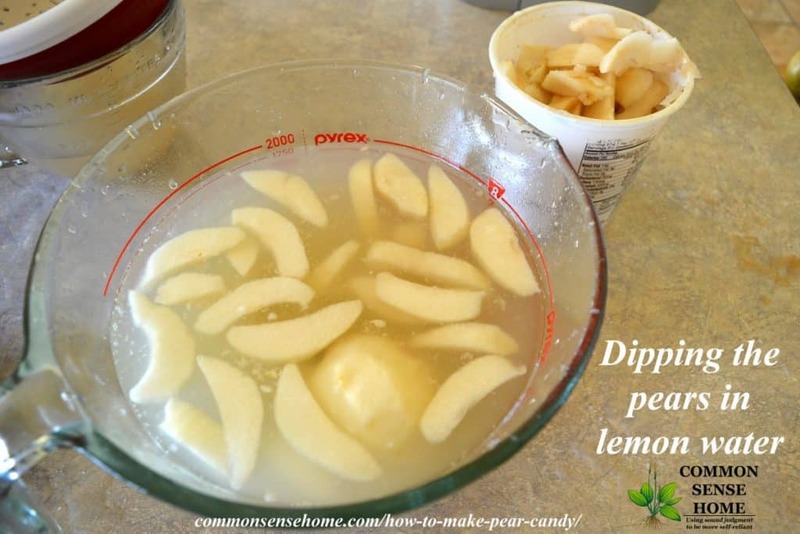 Dip the sliced pears in acidified water in a nonreactive container. I typically use lemon water with roughly 1/4 to 1/2 cup lemon juice to 4 quarts of water, but you could use any citrus juice or even pineapple. If you would like an even sweeter candy, use undiluted orange or pineapple juice. Note: With undiluted juice, the finished dried pears will be quite sticky. 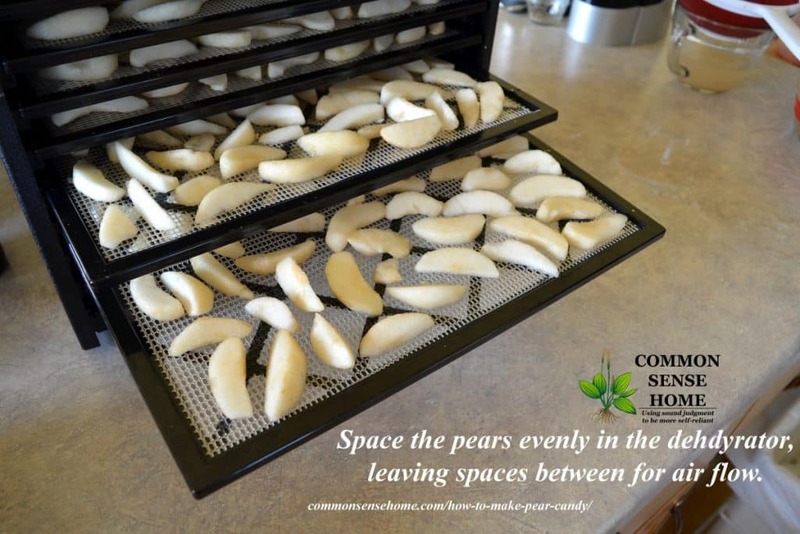 Load the pears on a mesh sheet in the dehydrator, making sure to allow space between the pears for good air flow. Dry at 135 ºF/57 ºC overnight or until fruit is dry and leatherlike. 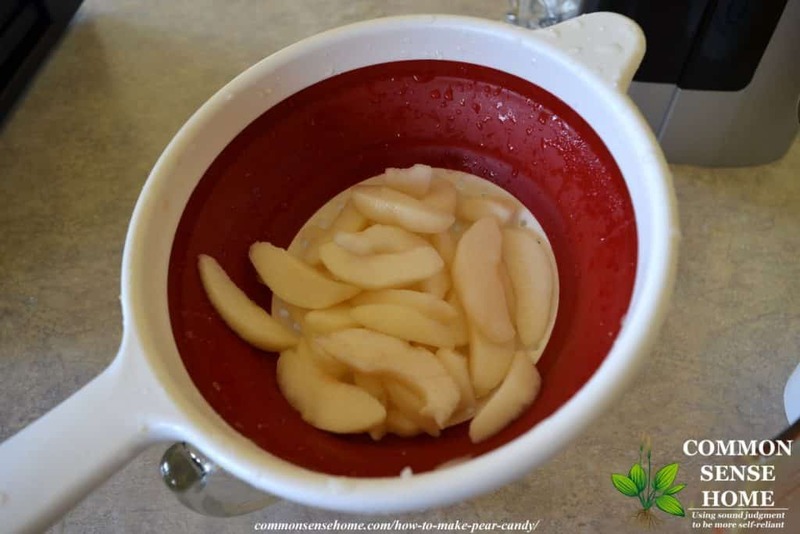 Depending on the moisture and sugar content (sweeter fruits dry more slowly because the sugar bonds to the water), dehydrating pears should take between 10 to 24 hours. Store in an airtight container. The dehydrated pears will be slightly tacky because of their high sugar content. 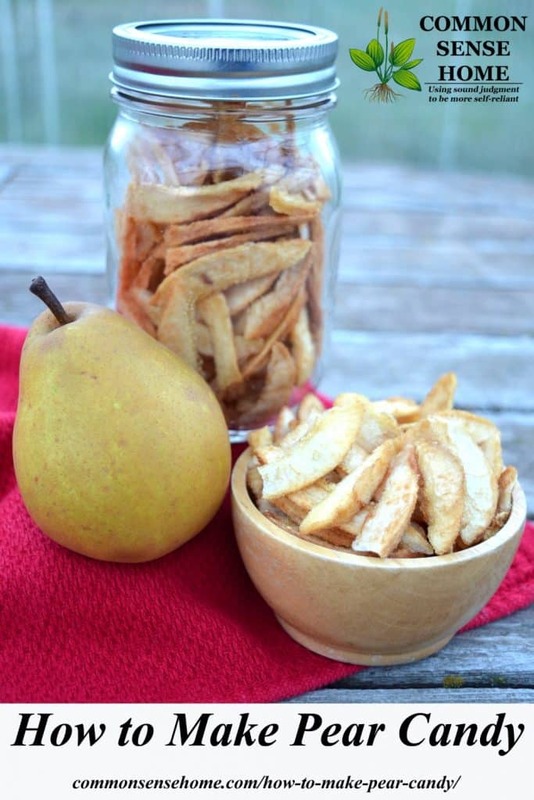 To make sure your dehydrated pears are dry enough – place the finished pears in a mason jar with a tight fitting lid. Over the next 2-4 days, check each day for any signs of condensation on the underside of the lid. 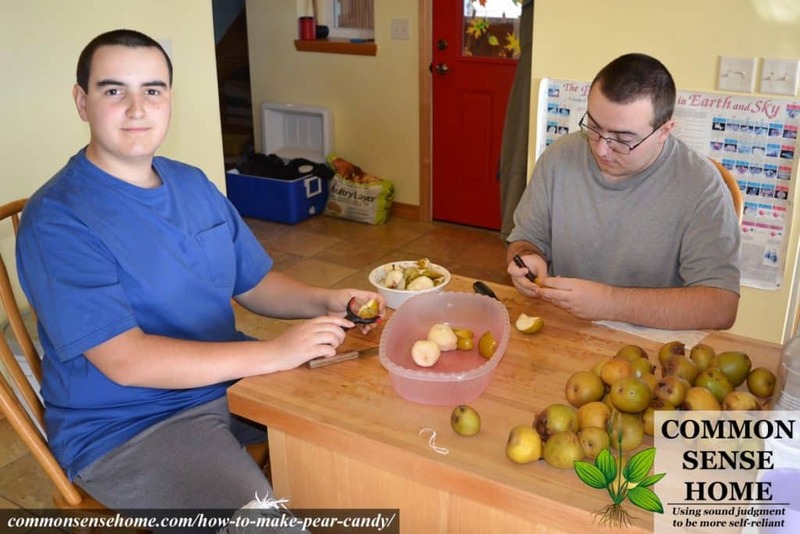 If there is condensation, place pears back in the dehydrator and try again. 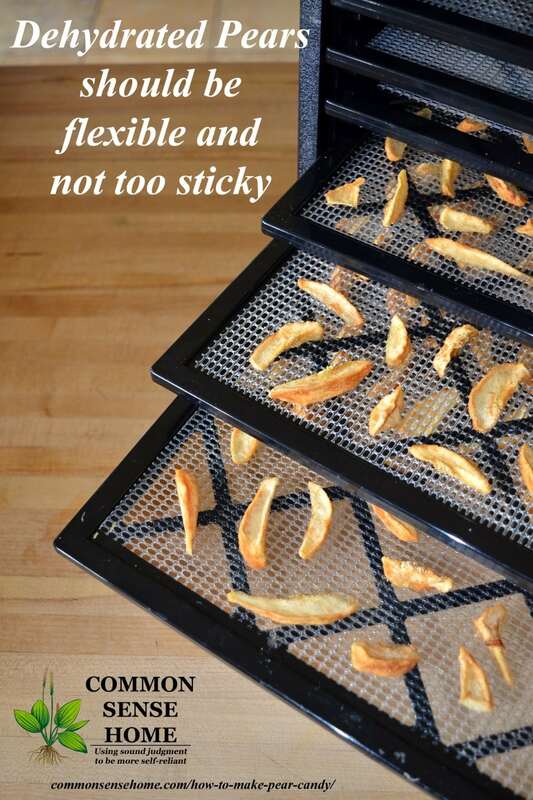 This same procedure also works well for dehydrated apples, but pears are sweeter. You can also sprinkle on a little cinnamon, nutmeg or other spices to mix things up. For long term storage, you can vacuum seal the pears in mason jars and keep them in the pantry for 2-3 years. For short term storage, a zippered plastic storage bag or other container will work fine. Just keep in mind that any container that lets air in (like plastic bags) will also let moisture in and decrease shelf life. You can keep dehydrated fruit in the fridge or freezer, but it's not required. The dehydrator shown in the post is an Excalibur 3900B 9 Tray Deluxe Dehydrator and is a real workhorse during harvest season. It can also be used to culture yogurt or cheese, or for making jerky. I also have a smaller Nesco FD-60 Snackmaster Express 4-Tray Food Dehydrator , which is nice for smaller jobs and great if you are on a tight budget. Pears are on my list to plant next year. Until that future harvest I have been eagerly tasting whatever varieties of organic pears I can buy and testing their drying qualities as I go. Your recommendation to apply a light coating of coconut oil to the drying sheets is very appropriate here. Otherwise the sheets will need a good soaking to get the gluey-sweet dried bits out of the mesh. I though it might be helpful to your readers to note that some pairs, like Bosc-types, will be quite sweet when not quite ripe. They will also be firm enough to get a good, uniform slice. When fully ripe they “melt” and are so juicy they are harder to handle, with a lot of it dripping away during handling. Bartlett types come out the best when almost entirely ripe. Once they are fully ripe, they bruise so easily that your dry slices will discolor no matter what, especially if they are peeled. The D’Anjou-type pears don’t really sweeten up until they reach the melting stage, and you’ll get the most out of them at the peak of ripeness, using a spoon to scoop the ambrosial sweetness directly into your mouth. Dried pears ARE candy. I have learned that it is prudent to pull out a couple of slices each and put the jar away directly, especially for the batches that come out perfectly, so stickily sweet they are almost carmelized. These are easier to prep if sliced NOT in wedges, but by laying each half cut side down and slicing directly down to the board. The shapes are not uniform, but the thickness is, so drying can be done at lower temperatures but will often take less time than wedges. One last point: Years ago we had an elderly neighbor who could no longer climb her treasured pear tree at harvest and pruning time. We volunteered to help, and she instructed us to pick the pears while still almost green to protect them from being stung. She instructed us how to lay them out in boxes to ripen, but cautioned us to cut and eat them before they were fully ripe because the seed cavities always had larvae that would hatch on ripening. How we all enjoyed those pears! Sure enough, if we let a pear go too long, the core would have a protein treat inside. I always wondered if her tree was being pollinated by a wasp, moth or fly that left an egg or two behind for posterity. I think you and I are sharing the overcast skies and drizzly rain that has hung on for days. No complaints, though. There was plenty of lingering, sunny fall to enjoy! Terribly overcast, rainy and windy here, too, today. Thanks for taking time to go into the specifics of working with different pear types and the reminder about oiling the drying sheets. I usually end up soaking mine with or without oil, but it does make them easier to get off. Sandy, what a beautiful post full of pear wisdom and life experience. And a perfect complement to Laurie’s page – where it is fascinating to learn about sulphites in addition to the great pear recipe and tips. This is an example of great internet sharing!